Costa Rica is home to many fascinating species of birds, wildlife and plants, and offers everything from pristine beaches and diving opportunities to the wonders of the rainforest. Many lines travel to this gem in Central America; here are the best 5 Costa Rica cruise deals. 1. Puerto Limon Costa Rica is a popular port of call. You can visit it aboard Princess Cruise Lines 10 night roundtrip from Fort Lauderdale from only $1357pp. This sailing also offers stops in Aruba, Cartagena, the Panama Canal, Panama, Colon, and Grand Cayman. 2. If you would like to explore Costa Rica from its Pacific Ocean side, then the Princess offering from Vancouver to Los Angeles is a perfect choice. This cruise starts at only $2006pp. for 10 nights. Stops also include Panama, The Panama Canal, Cartagena, Columbia, Aruba and Fort Lauderdale in Florida. 3. Costa Rica cruises on Celebrity Cruise Lines are on sale for the March 3rd, 2013 sailing, starting at $1304pp. This cruise is roundtrip from Ft. Lauderdale and stops in the Cayman Islands, Columbia, Panama, Belize and Mexico as well as Limon. 4. 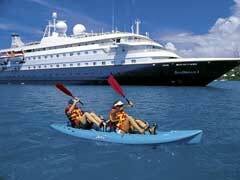 Costa Rica cruise deals for longer cruises also make the list. The offering from Oceania is an 18 night South American Cruise with prices starting at $3300pp. This roundtrip from Miami stops in Georgetown, Cozumel, Belize, Santo Tomas, Roatan, Balboa, Malta, Guayaquil, and Curacao, as well as travelling through the Panama Canal. 5. You can save 45% on the price of cruises to Costa Rica on Holland America. Their November 3rd, 2012 sailing is on sale starting at $1699pp. and sails from San Diego to Ft. Lauderdale. Ports of call include Mexico, Nicaragua, the Panama Canal, Aruba, Half Moon Cay, the Cayman Islands and Key West, as well as Costa Rica. With many lines sailing Western Caribbean cruises, you are spoiled for choice as to which ship’s itinerary fits your wish list the best. Costa Rica cruise deals can be had on many carriers, and you can see the country from both the Caribbean Sea coast as well as the Pacific Ocean coast, depending on which cruise you book and where you wish to depart. With its proximity to the Panama Canal, it allows ships a short cut to include other Caribbean destinations all in one cruise outing. Costa Rica cruise deals do sell out fast, so don’t delay and book yours today!